/ Coast path to Whiteford Nature Reserve. / Start of the hillside trail towards Llanmadoc. / Views down to Llanmadoc and North Hill Tor. / Iron lighthouse and Whiteford Point. / Views above Llangennith to Worms Head. 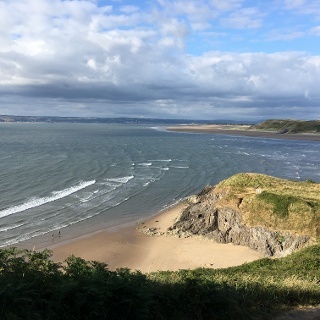 A relaxed loop walk passing through woodland and along the flat sandy bay of Whiteford Beach. Today combines inland and coastal walking at its best. 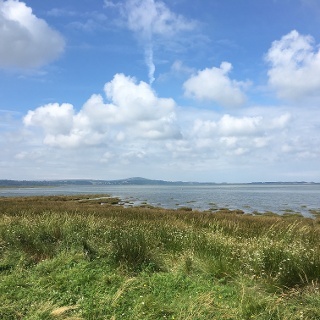 Head out to Whiteford Point and through the nature reserve. 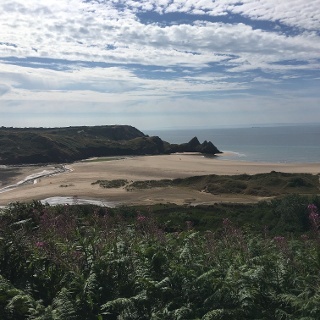 This low-lying peninsula which is sandwiched between the sea and the estuary is one of the most remote spots on the Gower and you will walk through a variety of habitats including dunes, beach, salt marshes, mud flats and woodland. At low tide it is also possible to walk across the sand and rocks to Whiteford Point Lighthouse. Built in 1865 it marks a dangerous shoal lying just off the point. Stop by the village shop in Llanmadoc and pick up a bottle of Welsh cider or beer to sip on Whiteford Beach. 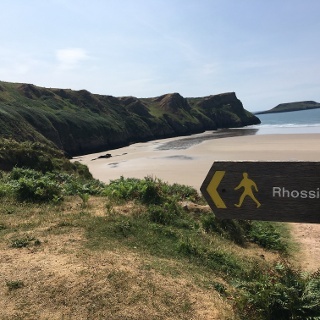 Check tide times before you leave as this route crosses Whiteford Beach, although it's still passable at high tide the walking will be much easier when the tide is low. The route also passes through land that used to be used as a military firing range. Avoid straying from the pathways and DO NOT pick up any suspicious objects. There are no stores in Llangennith although your B&B hosts may be able together a packed lunch for you for the day. Otherwise Llanmadoc has the Village Shop and Cwm Ivy Cafe, both great places to stop by for food and refreshments. Whiteford reserve consists of mudflats, saltmarsh and sand dunes. Together with Burry Inlet this forms one of the most important areas in wales for ducks and wading birds during winter. Be sure to carry a pair of binoculars with you when walking through here as birds such as oystercatchers, plovers, lapwings and Ospreys can often be seen. Spring through summer the dunes are rich in wildflowers and butterflies just adding to the joys of a stroll out to Whiteford Beach. On rounding Whiteford point you then pass Whiteford Lighthouse, this is Europe's last remaining iron lighthouse. 0.00 km – Starting at the roundabout in the centre of Llangennith, facing in the direction of Broughton Beach, TURN RIGHT to walk uphill to the end of the lane. 0.79 km – At the end of the tarmac lane continue STRAIGHT ON to join the gravel vehicle track as it begins to descend slightly. 0.99 km – Go through the metal gate and continue following the track as it BEARS RIGHT. 1.10 km – BEAR RIGHT heading away from Broughton Caravan Park towards the white house at the bottom of the field. 1.40 km – Just before the gate to the yellow farmhouse TURN RIGHT to follow the sign for Llanmadoc. Go through the metal gate and follow this shady route the whole way to Llanmadoc. 1.90 km – BEAR RIGHT as the trail now heads uphill. 3.20 km – At this point there are good views of North Hill Tor directly ahead of you and Llanmadoc to your left. 3.30 km – BEAR LEFT to follow the track as it now heads downhill. After 50m TURN RIGHT at the split in the track to go through a broken stone wall. 3.50 km – After crossing the field TURN RIGHT to follow the tarmac lane past the white houses. Once you reach the junction TURN LEFT. 3.60 km – TURN LEFT to pass the red phone box in the centre of Llanmadoc. If staying in Llanmadoc this is the point where you will start today's walk. Pass the phone box on your left, just beyond the village shop. 3.80 km – BEAR RIGHT at the split in the road to head downhill, away from the church, following the sign for Cwm Ivy. 4.10 km – After passing Cwm Ivy Café go through the wooden gate with the ‘National Trust’ logo on it. 4.40 km – TURN RIGHT at the junction following the sign for ‘Coast Path’ then through the wooden gate and continue following the gravel track through the woodland. 5.20 km – Go through the wooden gate and continue STRAIGHT ON as you leave the trees. 5.30 km – Continue STRAIGHT ON following the sign for ‘Whiteford’ as you now follow a sandy track across open land with mudflats to your right. 6.20 km – TURN RIGHT at the split in the track to follow the blue ‘Wales Coast Path’ way maker. 7.30 km – BEAR LEFT as you leave the woods, again following the blue ‘Wales Coast Path’ way marker, as you cross Whiteford nature reserve. Take notice of the sign explaining that this area used to be a firing range and DO NOT pick up any objects that you are unsure of. 7.40 km – BEAR LEFT to continue following a soft sandy trail across low sand dunes. 7.90 km – Continue following the beach as it BEARS LEFT around Whiteford Point and it’s Iron lighthouse, the only remaining one in Europe. Now follow the beautifully flat sandy beach for the next 2.5km. 10.30 km – BEAR LEFT to head inland at a sign explaining the habitats of the rare Beachcomber Beetles. Continue to head towards the large rocky cliff face ahead of you, following small sandy tracks. 10.50 km – At the split in the track continue STRAIGHT ON. 10.70 km – TURN LEFT to go through the gate and skirt the edge of the woodland, keeping the cliff face to your right side. 11.00 km – Go through the gate on the opposite side of the wood storage yard then TURN RIGHT to now retrace your steps along the route you walked earlier. 11.10 km – TURN LEFT through the gate. 11.40 km – Go through the gate and follow the road back towards the centre of Llangennith. 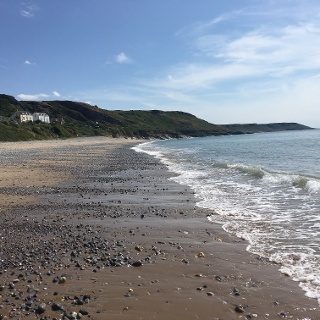 11.80 km – If staying in Llanmadoc then continue straight on back to your accommodation. If staying in Llangennith TURN RIGHT to follow the gravel trail past the white house. There is a signpost pointing the way to Llangennith. 12.10 km – You are now back on the trail you walked from Llangennith earlier in the day. Re-trace this route the whole way back to the village. 14.00 km – Go through the metal gate then TURN LEFT to follow the sign for ‘Broughton’. After 100m TURN LEFT to cross the field, heading uphill, then join the lane all that leads all the way back to Llangennith. 15.80 km – Your walk finishes here at the roundabout where you started earlier today.